Sometimes when I write this blog, I feel a tad guilty. Am I being totally honest here ? Am I portraying only a slice of my life here ? Am I writing only about the funny and smart things my kids say ? Am I hiding from the world that my PMS lasts for exactly 21 days and 5 hours, give and take two ? The thing is when you read a blog, anyone's blog you see only a slice of the blogger's life there. The slice the author/blogger has chosen to put forward for world viewing in HTML. So it would be wrong to assume a character, a life just based on the posts he/she may be doing. Just because someone eats organic almond flour pancake for breakfast and posts the recipe does not mean they don't eat phuchka for lunch. Just because someone is proudly posting pictures of masterpieces drawn by her 2 year old does not mean that the said 2 year old did not get a timeout for scribbling on the walls that very morning.If you give it some thought, you are only seeing a small window, like looking through the camera lens.What lies outside of that is nobody's business. You should neither judge nor form lofty opinions based on that. In my case, I mostly write about the funny things that my girls do because that is what I want to remember about their childhood. The fun part. I don't want to remember the tantrums, the meltdown, the shrieking screams, the tears, lots of them. They are a part of life for sure but ten years later they won't matter. This will. But today I want to write something different. Amidst the fun I also want to write about the learning and the growing. Both my daughters' and mine. So I usually write about LS's smart retorts which are really really funny and she is indeed a sharp kid, sharp as a knife and cute as a button. At four and half she reads menus at restaurants. Have I told you she is also funny? But also she is someone who takes a little time to warm up to people. Every kid comes with their individual traits and LS, I have realized is not very comfortable amongst a group of people she does not know much. I mean not strangers, just people she is not that familiar with. In that scenario she is a completely different person. She gets quiet, even timid and until few months back she would also be very intimidated by friendly gestures from such people. There were birthday parties where she would resort to howling and gatherings where she refused to talk to anyone. This in sharp contrast to the playful, naughty girl doing somersaults amongst people she is very comfortable with. And by "people she is comfortable with", I mean both friends and families she sees more frequently. No doubt her transition to pre-school was tearful and difficult. In the firs few months she refused to play with the kids in class and took to sticking to the teacher.There was a point I was also getting a tad worried because BS had been a moderately social child with an easy smile and an eagerness to participate in everything and I had no clue how to make LS more comfortable in a crowd. "You were exactly like that at her age." my Mother said. "You would chatter and talk non-stop at home and outside you were a bhije beral." I chose to ignore her statement. When I talked to her teachers early last year though, they seemed the least bit concerned and stuck to my mother's theory of "every flower blooms in its own time". I need not worry, she is a smart kid and plays with few kids if not all, they said. The only thing they however suggested I could do is to enroll her in some group activity classes to make her comfortable in large groups. Since BS was already learning taekwondo, I thought to enroll LS in the same class. I knew the teachers very well and if both kids could spend an hour there three afternoons a week, I could spend a good amount of time at Kohl's across the street.Yeah, that was my incentive. Also that my otherwise polite girls could beat up people in future if necessary. Last summer when I enrolled LS in the taekwondo class, after the first couple of classes she refused to go. Forget Kohl's, I would be sitting there in class with her and yet she cried. Her teacher however was an excellent gentleman with far more patience than mine. He never forced her to do any forms and tried to play games with her. Even on the day LS locked herself in the office and refused to come out, he managed it all pretty well. Didi, too helped by always being on her side. Slowly, and I mean really slowly, over a period of 3 months or so LS warmed up to her taekwondo class. 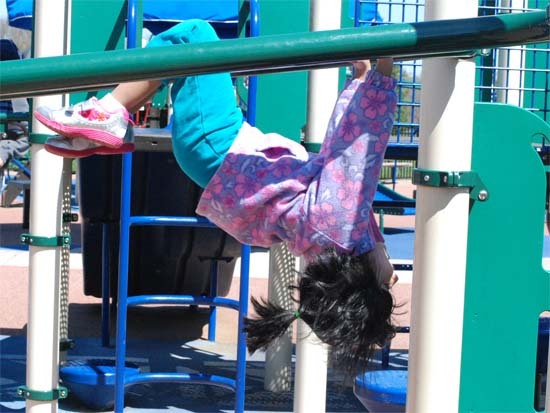 She played tag with her teacher, jumped on the trampoline, punched the dummies and also learned some karate moves. I think the class had a positive effect because even in her pre-school she gladly did the weekly sports classes and made more friends. "I just want her to be in the class. It is fine if she doesn't test for any belts," I would tell her teacher. At that point I was just relieved that she was at least going to the class and enjoying herself there. Finally, first testing came up around end of Feb this year. BS was testing for her brown-black belt. If LS at all wanted, she would get a yellow belt, the second level. I asked her if she wanted an yellow belt. "Yes, Mr.K has said I am ready, " LS said, very confident, uncharacteristically excited about testing day. I gathered she had no idea that there will be loads of parents that day and she would have to demo her moves in front of them. I tried to prepare her by telling that there might be more people in class on the day but she need not worry and such but she didn't really pay me enough attention. On the day of testing, when we reached the school and she saw all those people there, her face darkened as excepted. Soon tears started rolling down her cheeks. She being the youngest student in the class, the other parents were actually happy to see her and more friendly than usual. That made things only worse and she refused to leave our side. Finally after much pep talk by me, the Dad, the sis, the teacher and an incentive of frozen yogurt with loads of topping, she went on to do her form exercises. Her face was still tense and my heart probably beat faster than hers. But I knew she needed this push for her own good. She however did everything that was expected of her albeit with less power and vigor than on her regular days. Test over we came back and the day was forgotten. Next week was result and LS got her yellow belt. She had done her form in full and so she passed on to the next level. We tried to make a song and dance of it and she too seemed a little proud of her yellow belt. There is still miles to go for her to be more open of people but we do see a lot of changes. She has quite a few friends in school and her class teacher really loves her. Thirteen yeras later when she packs her bag and steps into the outside world, I want to remember her first yellow belt. It must have taken a lot of courage for her 39" petite frame, to do those exercises in front of people she did not know but she had survived and survived good. And I am sure she always will. To conquer her fears and step out, to face the world and say "Hai-Yah"
Now to the chicken stew, which this time is Kerala style. 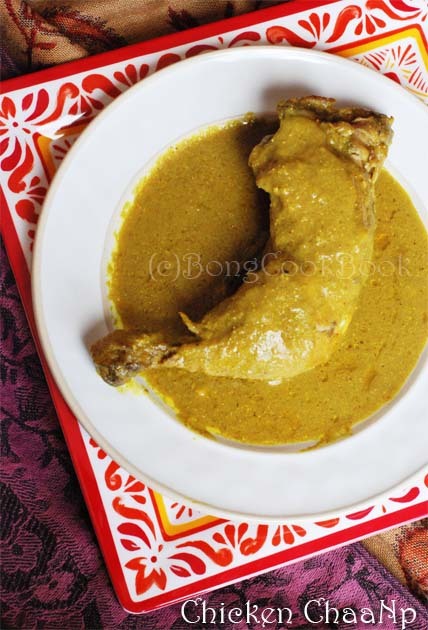 LS loves chicken and every Sunday a chicken curry is made with her in mind. BS is not too fond of meat these days and I try to make a chicken dish that caters to all four of us as a Sunday lunch. 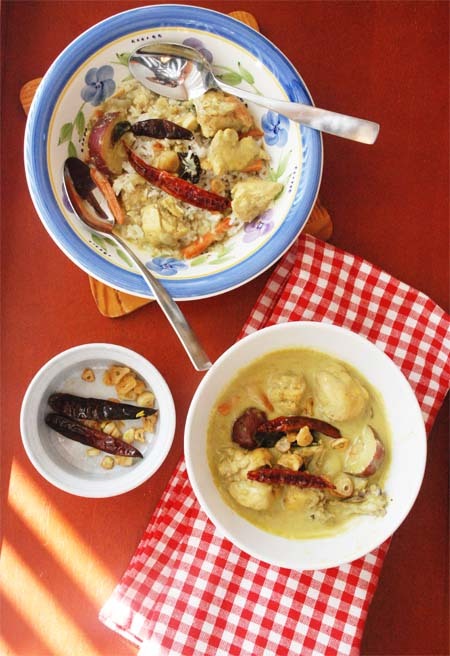 We are quiet fond of this Kerala Chicken stew with creamy coconut milk from Mishmash's blog. I have adapted it and add vegetables like carrots and beans to it sometimes. My method is also a bit different to suit my taste. I also make it less spicy for the kids. To make it spicier for us, I use Preeoccupied's idea of finishing off with fried red chilli and garlic slices. Spooned over a bowl of rice, this creamy and fragrant Kerala Chicken Stew makes a lovely Sunday meal for us. It really really is very good. Cannot thank Mishmash and her beautiful blog enough for it. Chop about 4-5 small red potatoes in halves. When you get the flavor of the garlic remove the garlic and red chillies and keep aside. We will use this for garnish at the last stage. Now to the garlic flavored oil add the chicken pieces. Saute the chicken pieces till they loose their raw coloring. If water is released from the chicken, cook till water dries up. Remove the chicken pieces and keep aside. Add some more oil if needed to the kadhai. Soon the fragrance in your kitchen will be so beautiful that you will forget Dior. Fry till the onion is soft. Next add the potatoes and carrots cooked in the microwave. 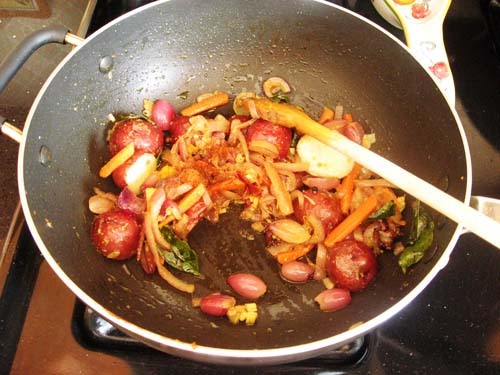 Sprinkle 1/2 tsp of home-made Garam masala powder and saute the vegetables. and let the gravy come to a boil. Add 1 more cup of coconut milk, lower the heat, cover and let the chicken cook. You can also heat a tbsp of ghee in separate pan, roast some cashews and add it to the stew as suggested in the original recipe. I often skip this step though it boosts the flavor. Yesterday around lunch I asked a question on FB. Here is what I asked. While I was eating my oatmeal at lunch, going through suggestions of excellent recipes with sheem, my tummy growling, my heart aching, I suddenly realized I did not have sheem at home. I had snow peas. There was no way I was going to make a stop at Patel in the evening to get half a pound of sheem. Jalebis might have made me do so, but not sheem. Thank you. 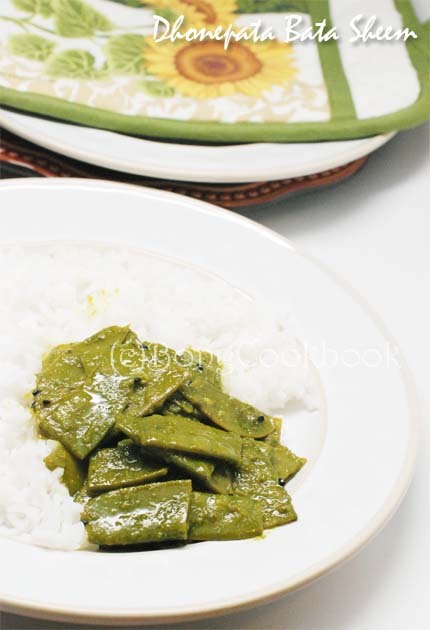 Now a lot of the time when I am making dishes like paanchmishali or labra, I throw in the snow peas and call them sheem. Of course that doesn't make them sheem but they are sheem like -- sweeter, tender and at the risk of being lynched tastes better than sheem to me. When I put them in any non-Indian dish, I just call them snow peas. That sounds very right for the soy sauce infused stir fry. But I have never told anyone about my habit of dual naming of the snow peas. 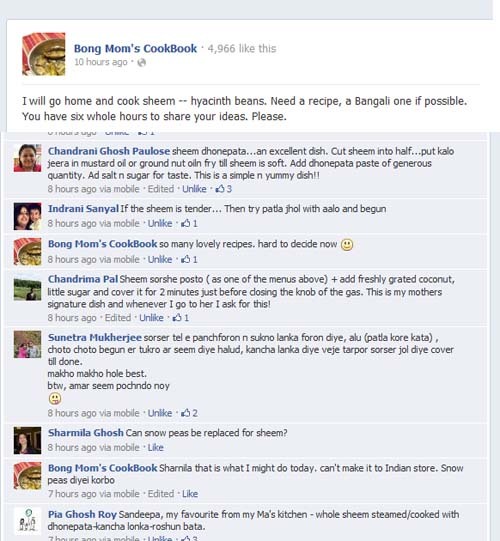 I mean what if people think I am tarnishing the Bengali culture by substituting snow peas for sheem.This simple act of mine might might ban me from my BongMom-dom. But then Sharmila asked --"Can snow peas be replaced for sheem?" And I heaved a sigh of relief. So there are people out there who think like me. 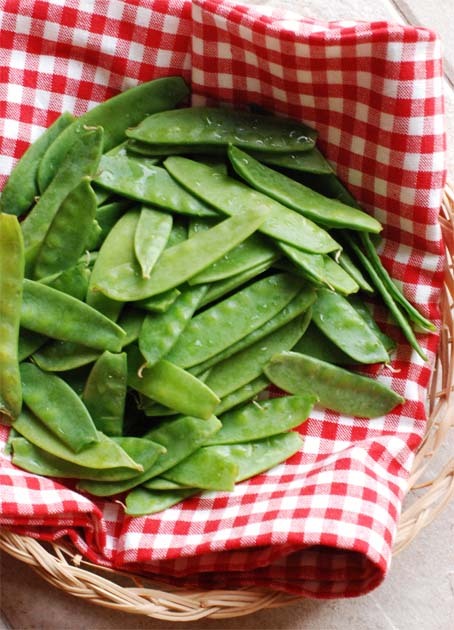 Who sub sheem with snow peas in times of great need and depression. That issue resolved I went ahead with Pia's Mom's and Chandrani's excellent recipe of Sheem with Dhonepata Bata -- Hyacinth Beans with Coriander paste.Ok, ok in my case snow peas. But we will not tell anyone that. We will stick with sheem. This recipe was very different from the shorseh-posto bata ones I have always had. The paturi and shorshe sheem are the ones I am more familiar with. The fresh scent of coriander in the Dhonepata Bata sheem inspired me.That someone's Mother's recipe would be made in my kitchen and the same flavor will bond families who have never known each other and yet share the same food culture, sealed the rest. Thank you Chandrani and Pia who blogs at Peppercorns in my Pocket. Loving it. I used 3/4th of the amount of snow peas as shown in the second pic. Around 25 snow peas, estimated. I think a thicker paste was required but mine was more liquidy. Now add the coriander-garlic paste. Add salt to taste. Mix well. Cover the cooking pan and let the vegetable cook. If needed remove cover, add little water. cook till veggie is done. Add a pinch of sugar and adjust for salt. Serve with white rice and a touch of kashundi if available. If you land up on a random day at my home with kids in tow, you will not find a pack of Oreo cookies, sack of Doritos or a bag of soft chewy cookies in my pantry. It is not that my kids survive on carob chips and spelt flour cookies. I don't even know what they are, just wrote them like that. But because if I do have the oreo and the doritos, the conversation every 15 mins goes like this. "You are being mean. I don't like you," followed with lots of tears and feet stamping. Good. If things get still worse, a white paper is scribbled with "I Don't Like Mommy" and presented to me with much flourish. Remind me who said that crap about Motherhood and divinity ? Usually it is the younger one delivering the above dialogs. The nine year old is pretty aware about healthy eating, what with the school enforcing it and nothing but fruits or veggies being allowed for snack in school. The younger one though a fruit lover will eat cookies/chips and candy if she can set an eye on them.I am still monitoring Valentine Day candies and rationing 4 M&M's a day. So I have stopped buying the kind of junk snack I don't want the kids to eat unless of course they are on vacation and I want peace. However when it comes to Nutella, my views are pretty relaxed. I like to believe Nutella is made with flax seeds and has Omega 3. What ? It doesn't ? Oh bummer. 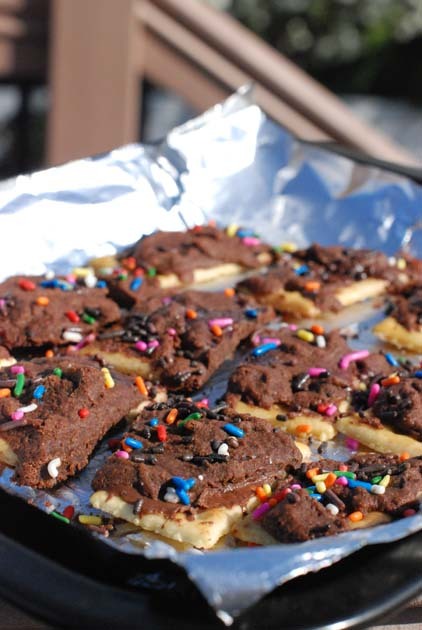 So when I came across the Chocolate covered Graham Crackers at Tasty Kitchen, a voice in my head whispered "NUTELLA"
We have been making nutella covered crackers since then. It is child's play. Literally. And it is the 9 year old child who does it except for handling the hot bowl or tray part. We have used different kinds of crackers as base -- Marie biscuit, saltine crackers(the ones like cream cracker) and club crackers. The club crackers taste the best and the girls love it. They add sprinkles and stuff to pretty the crackers up and are very happy to have their own homemade chocolate crackers. Well, after the first few times LS lost interest in these crackers though. She however hasn't asked for oreo either.But BS loves them and it works perfect for her snack. For the recipe of these crackers and a review of Chitra Banerjee Divakurani's latest children's book "Grandma and the Great Gourd" head over to my Kids' blog. 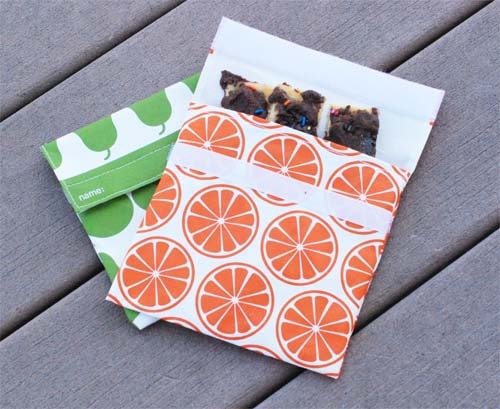 These lovely Lunch Skins reusable sandwich bags were gifted by my blog friend Indosungod. It was a pleasant surprise when they arrived on Friday. The amazing thing about these bags which can be used to pack sandwiches, cookies etc. is they are reusable. Cleaning is also very easy as they can be put in the dishwasher. Thank you so much Indo. The girls loved their bags and cannot wait for Monday. In fact BS liked them so much that she put her crackers in them and clicked the above pic. I wish I could have said this recipe is my Mother's given to her by her great-great-grandfather Wajid Ali Shah's master bawarchi. I wish I could have said I was born into this recipe. But sorry to disappoint. Many of you have been born into it for sure as you have been with recipes of creme brulee and chocolate gateau. But nope. Not me. Darn, my Ma. 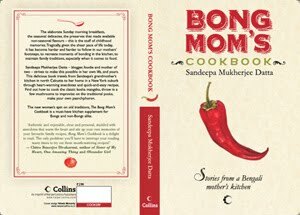 In fact for a large part of my childhood, the chaanp and biriyani, the Mughlai influence on Bengali cuisine eluded me. You see we were probashi bangalis, the clan of Bengalis that live and breathe oxygen outside the state of West Bengal or rather Calcutta. In the town steeped in history that we lived, chaap or chaaNp was not a much known affair. At least wasn't in the years when I was a 8-9 year old. When we ate out, it was largely Naan and chicken curry, dosa and sambhar, even chowmein and chilli chicken. But never a "Chicken ChaaNp". In our annual pilgrimage to Calcutta, the heart of Bengal, during the winter vacation, the "chaaNp" and "biriyani" should have showed up frequently. But surprisingly it didn't with that much regularity. My maternal grandparents lived in North Calcutta, a more traditional neighborhood where sweet stores like "Kalika Mistanno Bhandar" selling karapak sandesh and mishti doi in earthen pots and small telebhaja stores selling beguni and chop, dotted the streets. Moghlai Parota and fish kabiraji were still to be found, but in those years, restaurants like Rahmania and Aminia had not stretched their franchise hand to the Northern paras with rezalas and nawabi biriyanis. The Mughlai restaurants like Nizam, Shiraz, Sabir, Aminia and others were all concentrated around Park Circus and Park Street areas where clientele were much more varied and there was a larger Muslim and anglo-Indian population. You must remember I am talking about the fag end of 70s and early 80s here. So we rarely tasted a"Chicken chaaNp" or a "rezala", those being earmarked for the one day we would traipse down New Market. On all other days of the vacation I was happy to eat Dida's koraishutir kochuri, puffed and filled with sweet paste of sweet green winter peas and a soupy magur maacher jhol and rice. "The influence was reinforced in the Raj era, when Kolkata became the place of refuge for many prominent exiled Nawabs, especially the family of Tipu Sultan from Mysore and Wajid Ali Shah, the ousted Nawab of Awadh. The exiles brought with them hundreds of cooks and masalchis (spice mixers), and as their royal patronage and wealth diminished, they interspersed into the local population. These highly accomplished cooks came with the knowledge of a very wide range of spices (most notably jafran saffron and mace), the extensive use of ghee as a method of cooking, and special ways of marinating meats. In Bangladesh, this food has over time become the staple food of the populace. It was only in the early 90's when being in college and traveling more on my own and with friends in Calcutta, that I became familiar with the "chaaNp" or "chaap". This was also the time, rezala from Sabir's and Biriyani from Shiraz became food that I came to adore. I was smitten by the Mughlai cuisine that Bengal had adapted. However I did not try to learn to cook it. It was always available and in the 90's pretty easily. Also I rarely cooked then. The Chicken ChaaNp that I am going to write about today is a recipe that has built itself over days. The base came from a friend, on that I added bits of experience and flavors of my own Garam masala, the idea of charmagaz(melon seeds) and rose water came from Sayantani's post which I adapted and replaced with poppy seed-cashew paste, the lust for it came from Indrani's chicken chaap and Preeoccupied's Kosha Mutton ChaaNp. 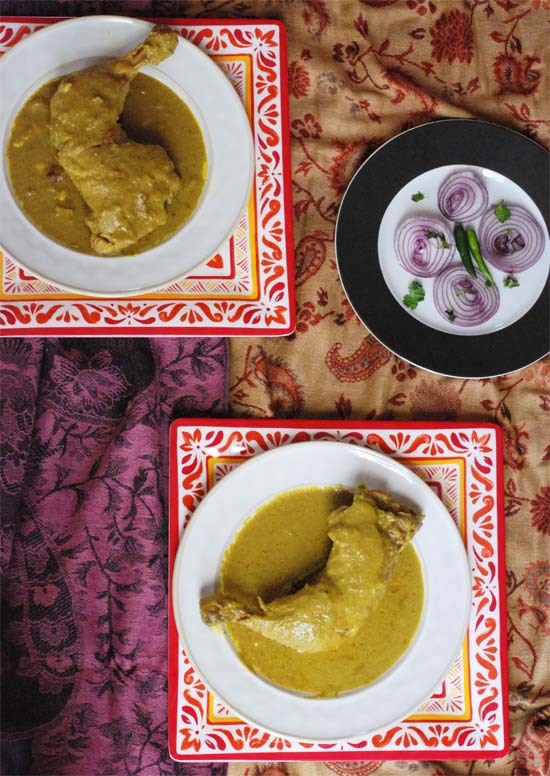 Though Mutton Chaap is made with usually ribs, the chicken chaaNp I have had were always made with leg quarters in a thick but not clingy gravy with a fine layer of oil floating on top. The key to the recipe is marinating the meat in a onion-ginger-garlic-garam masala-kewra water paste and then cooking in ghee over slow heat on a pan with a flatter surface. I however have used only very little ghee. The slow cooking anyway releases a lot of oil at the end so I feel the amount I use is fine. You are welcome to use more ghee for a richer version. The poppy seed-cashew paste gives a thicker texture to the gravy, the kind I remember and the kewra water gives it the Mughlai scent. The dish actually is pretty easy to make. Do not get intimidated by the Steps under Prep. They are all very simple. So if you are all set for a Nawabi evening go ahead and indulge yourself. Serve this dish with some biriyani but I would say store-bought Naan does most justice to the dish and also cuts your effort in half. 2 medium sized onion in large chunks. Note: I use boiled onion for two reasons. Raw onion paste tends to get bitter at times. It also takes longer to cook raw onion paste. If you want, go ahead and use raw onion paste but remember to cook it for a longer time. We will use half of this as marinade and rest half in gravy. So store half of this paste in a separate container to be used later. In a large-is tray put the washed pieces of chicken. Make slit in the chicken pieces and rub with salt and about 1/2 tbsp of Garam Masala powder. Now add a tsp of sugar to the oil and brown the oil by swirling the pan. Next lower the heat and add in the onion-yogurt-ginger-garlic-spices paste you had prepared and stored. Fry this paste for about 5-6 minutes at low medium heat. Shake off excess marinade from the chicken pieces and add them to the pan. Do not overcrowd them and the pieces should lie side by side. Cook/Fry the chicken pieces till their raw coloring is gone and they have taken on a light yellow coloring. Do not deep fry the chicken and they should not turn brown. Also add the remaining chicken marinade and some salt to taste. Gently mix and cook for 6-8 minutes. Cover the pan now and at low-medium heat let the chicken cook. Usually the chicken will release water and will get cooked in its own juice. No need to add any extra water. However if it is getting too dry, add little water judiciously. It will take around 30-40 minutes for the chicken to get fully cooked. Once the chicken is done and a thin layer of oil has surfaced, taste the gravy and adjust for seasonings. At this point if you wish, you can also dry off the gravy a little. Add few more drops of kewra water at this point if you wish. Serve with Biriyani or Naan. I have seen the gravy and chicken tastes much better when had the next day. So give some time for the flavors to mingle before you serve. Fifteen years ago if a tarot card reader had told me that fifteen years later I would not only be cooking and eating raw papaya with a smile on my lips but also forcing others to do so, I would have balked. I would have have also "pooh-poohed" away the whole idea and not paid the tarot card reader in full. Ten years back if my daily horoscope in TOI predicted "raw papaya eating days in the near future", I would have stopped reading it then and there. Wouldn't have waited five more years. To stop reading TOI I mean. Five years back when my Ma said I should buy raw papaya once a week and ripened papaya twice a week, I ho-hummed. "Okay, what the heck. We can do this once in a while," I told myself. I still do it once-in-a-while. Do not have the devotion towards it like my Ma. But maybe soon. Five more years to go and we will see. I really do not understand the Bong's uncanny diligence towards random health food items like beler paana, kaanchakolar jhol(raw plantain curry), kaancha peper tarkari(raw green papaya sabzi) and chirotar jol( a drink so bitter that it will scald your soul and detox you like no other). Either it is karma or it is evenings spent eating out egg-chicken roll, tamarind water phuchka, engine oil deep fried telebhaja and heavy on ghee(or is it dalda) biriyani. Of course too much of the latter needs to be balanced out with at least some of the former. The bowel, and that too the Bong bowel, not to be confused with Bong baul, can take only so much. But poor me does not eat too much of the roll and phuchka these days, and I don't have many fond memories of kaancha pepe to share. I was one of those kids who would suffer through chicken pox, mumps, measles, jaundice and typhoid in an entire school year and the jaundice only made sure that I had my fill of mulo seddho(boiled radish) and pepe seddho(raw papaya boiled) at an early age. Too much of anything good is bad for you and so there went my papaya devotion at an early age. But this grated raw papaya sabzi is very different from the usual raw papaya curry.It elevates "pe(n)pe" to a different status. This "pe(n)pe" is fit for high heels and bejeweled chiffon. Maybe Nigella (Lawson) eats it on Saturdays. I am not sure but who knows. 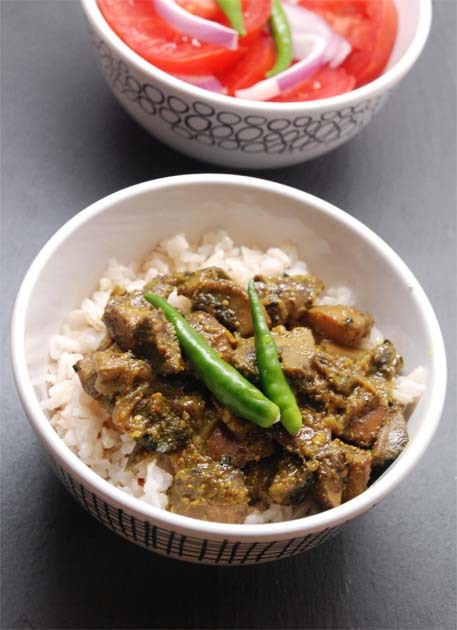 Not that it is better than a kosha mangsho but it is better for you. The recipe for this grated kaancha peper tarkari is sourced from my Ma. Also my friend's Mom makes a similar dish. It is a simple dish but what with the papaya being grated and the addition of coconut makes it really good. And when I say "Papaya is good" you have to believe me. If you still have doubts go ahead and add some shrimp. It can only get better from here. Grate half of a medium sized raw papaya in a grater. 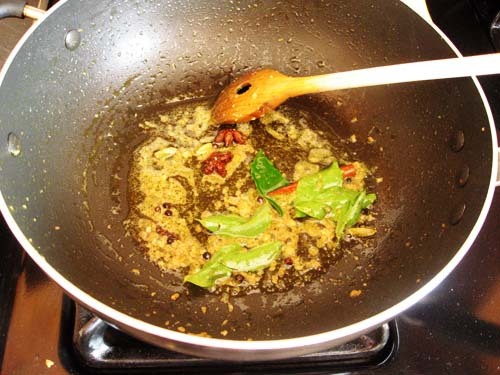 Temper the hot oil with Kalonji and slit green chillies. Follow with a clove of garlic finely minced and quarter of an onion thinly sliced. Saute till onion becomes soft. Next add the grated papaya. Sprinkle some turmeric powder, red chilli powder, salt and mix well. Add 4-5 more slit green chilli and saute at medium heat. Cover and cook until papaya is almost done. Add sugar to taste and some grated coconut. I used frozen grated coconut. Mix well and cook till everything is done. Taste and adjust for seasonings. Serve with rice. For the shrimp option, saute some small shrimp with salt and turmeric and at the last stage mix with the papaya sabzi. 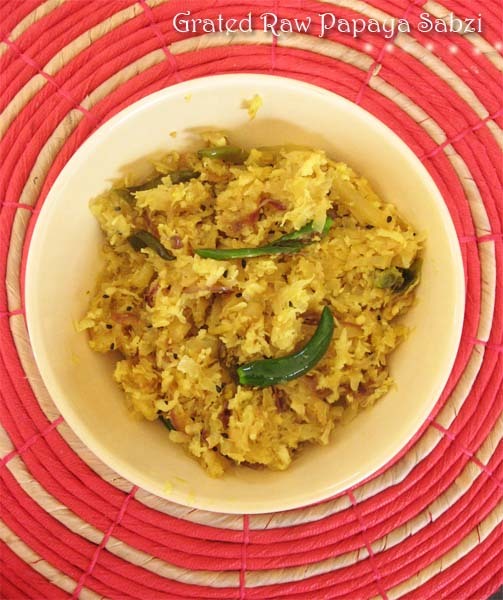 Since I have made the aam kashundi, my week night dinners have gotten easier. 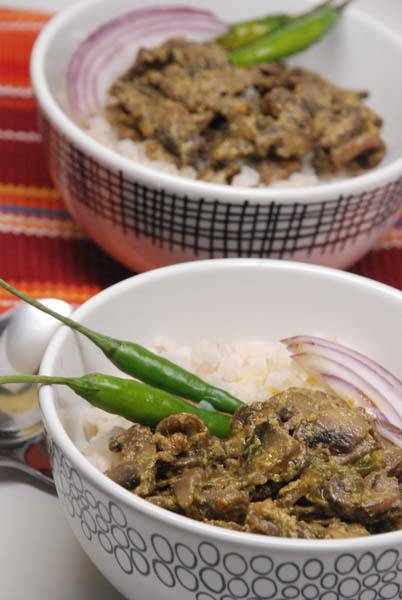 Last year inspired by Sharmila @KichuKhon and another reader(Mahua Maharana), I had made a Shorshe Roshun Mushroom -- Mushroom in mustard, garlic sauce. It was so good that since then if I ever make mushroom at home it has to be that. The garlic with mustard is the greatest idea on earth. That time I had just used the Cookme Mustard powder and garlic paste and the result had been delicious. You can see the set of pictures on FB here. Now you can just imagine the level to which the dish was elevated when I used Aam Kashundi. When the spices hiss add the chopped up mushroom. I used a whole big box of button mushrooms. The mushrooms release a lot of water. A lot. And it is necessary that you dry the water up. Mix everything together and cook with frequent stirring till the 'rooms are done. Finish off with slight drizzle of mustard oil.